Christmas is just around the corner and you really would like to bake a memorable dessert for the family, something with a holiday theme. Since a Fruitcake is absolutely out of the question (you don't want a repeat of the chipped tooth incident), why not try a Christmas cheesecake. This delicious Christmas cheesecake is to easy make and the lovely to look at too. With the Christmas tree sprinkle as decoration and cherries added to the filling, not only do you have a delicious desert, you also have a festive treat that is sure to generate a lot of smiling faces. You may even want to make two. I'm sure they'll be begging for more. Preheat Oven at 350 F. Make your Graham cracker cookie crumbs by using a food processor or simply place in a plastic bag and crush using a rolling pin. Next mix Graham Crackers, melted butter, sugar and vanilla extract in a bowl. Spread in the bottom of a 9" springform pan and up slightly up the side of pan. Bake in oven for 8 - 10 minutes. Remove from oven and let cool. Preheat Oven at 350 F. Using an electric mixer blend cream cheese on low speed in a mixing bowl. Use spatula to scrape sides and paddle of mixer. Mix in sour cream. Add in the sugar slowly, and continue to beat until creamy. Add in vanilla extract and mix until blended. Add in eggs one at a time and continue to mix a lowest speed until eggs are incorporated in the batter. Mix in whipping cream. Fold in cherries and continue to mix. Pour the mixture into your crust and use offset spatula to help scoop out the batter. Bake for 45 minutes to and hour or until center jiggles or the top is slightly brown. Remove from oven and let cool on a wire rack. 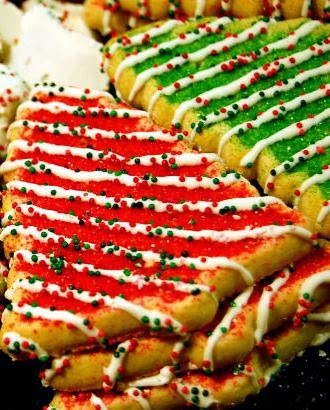 While cooling, sprinkle Red and Green Tree Sprinkles of top. Place in the refrigerator and allow to set. Hopefully this will add to your holiday cheer and have your Mr. Scrooge wishing everyone happy holidays. Enjoy. Cedrick White is an avid baker and publisher of I-Love-Cheesecake.com and offers advice and information on baking and a wide variety of subjects that interest him.